I've been working on a new system to implement in my grade 1 and 2 class. They can be very unruly at times and a friend of mine suggested this great class management idea the other day, and I am ready to try it out this week! I made these Inside Out Themed Check Cards today, I will laminate them and then have the students write their names with a white board marker when they come to the lesson. I will explain that 10 checks will mean 1 coupon. (See my English market post to understand the coupon system). When they are doing the activity well and being good , I will come round and give them a check. When they are unruly, I am able to take a check off. I am hoping that this works well and my friend who suggested the idea said it's a hit in her class. She also gives candy instead or with coupons. Also a nice idea. These are absolutely free for you to download, and edit in word. Go to my Teachers Pay Teachers site to get them. You can delete the Korean words on them too. And how will you account for the little ones who surreptitiously give themselves a check when the teacher isn't looking? Hi, I am the only one with the marker. Tried this, it was pretty good. The little ones took a while to get the check mark system but soon it was understood. I'm going to keep it up as I need to keep them in line. Thanks, oh and they love the Inside Out theme! Hi! I'm working in Japan and I love this idea but I'm a bit worried about making the kids cry if I punish them? I'm the main teacher for English, but usually it's not up to us to discipline the kids as we're more supposed to be there for them to have fun with English (it's not officially an ES subject). I also have 4 schools, so for example, I'll only see one 1st grade class 10 times the entire school year. So it's hard to have a sense of continuity, and have a consistent reward system. Do you think this would work in terms of how they behave as a class and having one A4 sized card for them to see? I'm thinking I could discipline them by taking off checks when they get too rowdy as a class, or if a few of them are goofing off too much. What do you think? Hi Emily, I hope this reply reaches you. I think this system could work for you as I am in a similar situation. I only see my grade 1 & 2 class once a week but more than 10 times in a school year but under 20. However, I would try not to take away check marks as they always say negative doesn't work as well as positive. So instead of taking away check marks rather, do not reward them if they aren't doing what is required. For example, when we played a game recently, and they had to fill in their Bingo board before we started playing, I told them they will get 1 check mark when they complete it. They all rushed to do it. Except one boy was making trouble and not focusing on the same task so I told him (as it's very low level) "no point?" and he understood, if he did not finish, he would get no point (check mark). Soon, he started focusing because he wanted the coupon at the end and I found that the students didn't want to be left out from receiving the check marks - they're all about getting equal treatment in my class. 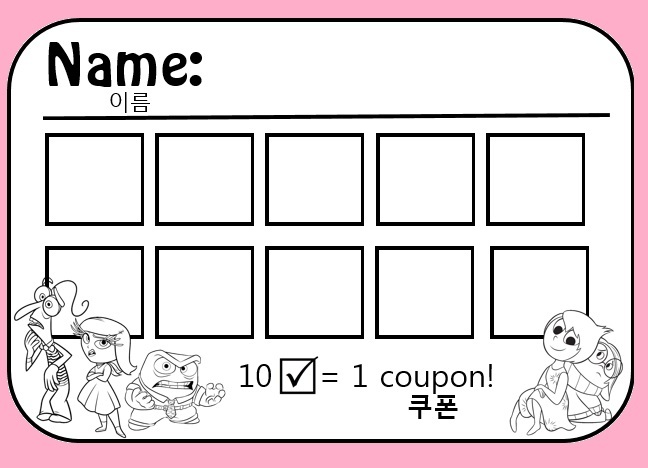 So usually, by the end of each class everyone will get a coupon. However, one class I was so disappointed in one boy's behavior as he hit another classmate, so I didn't give him the final check mark and he got upset but sometimes you need some tough love. The next class he didn't play up. I know they're young but I think most of us can tell when it's crocodile tears! haha, I hate babying them too much, they take advantage. And although I admit, this didn't work amazingly in the first class, by the third, it worked well. I hope this helps and I'd love to know how it goes. Feel free to contact me anytime! Also, I know my friend and fellow teacher, printed these out and laminated them to be A5 size then pinned them to the wall. She also wrote the student's names on them also. Then, when in class she uses them and the kids don't touch them at all, she controls it all - similar to a star system. I like the idea of the kids holding them or having them stuck to their desk during the class? It to me, just seems like they are more in control of their behavior. And get to visually see their progress.